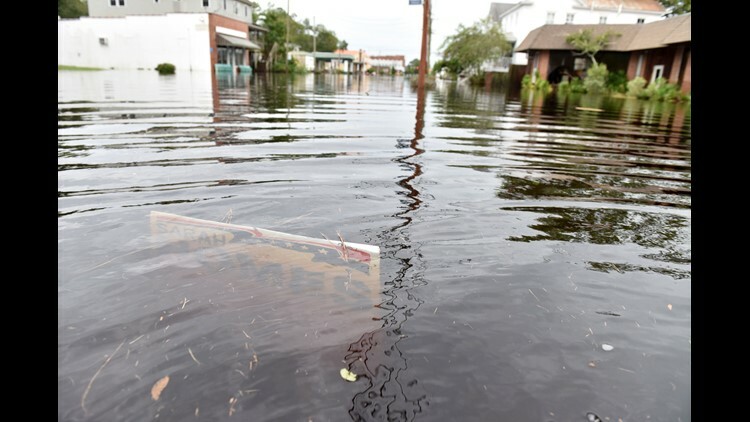 A campaign sign is under water on Pamlico St in Belhaven, N.C. on Saturday morning on September 15, 2018. NEW BERN, N.C. – Rivers approached record flood stage and more than 680,000 utility customers were without power Sunday as North Carolina struggled under the crushing fury of Florence, the mighty hurricane diminished to a tropical depression but still pounding the region with unrelenting rain. The Florence death toll rose to 13 when authorities in South Carolina revealed that a Horry County couple died from breathing in carbon monoxide from a power generator in their home. Florence has stalled over the Carolinas and was forecast to dump up to 10 more inches of rain in some areas, the National Hurricane Center said Sunday. Parts of southeastern North Carolina could see up to 40 inches before the rain ends Monday. And the damage isn't confined to the coast. "These rainfall amounts will produce catastrophic flash flooding, prolonged significant river flooding and an elevated risk for landslides in western North Carolina and far southwest Virginia," the hurricane center warned. Sections of two interstates, I-40 and I-95, were shut down due to flooding and debris. Several rivers were approaching record levels, and officials warned that cresting in some areas won't come until later in the week. In New Bern, hundreds of people were rescued from their flood-swamped homes. Evidence of Hurricane Florence’s wrath was sprawled across the lawn of the Patty and Philip Urick’s home on the Neuse River, all but destroyed by violent flooding. The couple, who moved into their three-story row home 14 years ago, rode out the storm. Rainfall in historic Swansboro, a tourist town on the coast dubbed the "friendly city by the sea," had the highest measured rainfall total at a whopping 34 inches. National Weather Service meteorologist Bob Oravec said other cities also are likely to see 30 inches before the rain finally stops. "This is historic in terms of the amount of rain from one storm in North Carolina," Oravec said. Evacuations were still underway in some places. Fayetteville Mayor Mitch Colvin told people living within a mile of the region's main river, the Cape Fear, or the nearby Little River, that they had until 3 p.m. Sunday to get out. Cape Fear River is forecast to crest in Fayetteville early Tuesday and remain in "major" flood stage into Wednesday, Oravec said. Even by week's end the city could be experiencing minor flooding from the river. "If you are refusing to leave during this mandatory evacuation, you need to do things like notify your legal next of kin because the loss of life is very, very possible," Colvin said. In Newport, rescuers were able to reach a flooded animal shelter after the Carteret County Humane Society put out a call for help on Facebook. The Cajun Navy, a group of volunteers in boats, brought two stranded shelter workers, 43 dogs, 80 cats and roughly 15 chickens to safety. Early Sunday, the storm was centered 20 miles southwest of Columbia, S.C., with winds of 35 mph. Florence was moving west at 8 mph. The heaviest rains were falling on the north edge of the storm, so North Carolina was getting the worst of it. But South Carolina wasn't entirely spared: Myrtle Beach was hit with more than 7 inches of rain. And almost 60,000 utility customers were without power across the northern part of the state. President Donald Trump acknowledged the victims of Florence in a Twitter post. "Deepest sympathies and warmth go out to the families and friends of the victims," Trump said. "May God be with them!"